Isaiah Pineiro had a big night Tuesday in the game against Colorado. 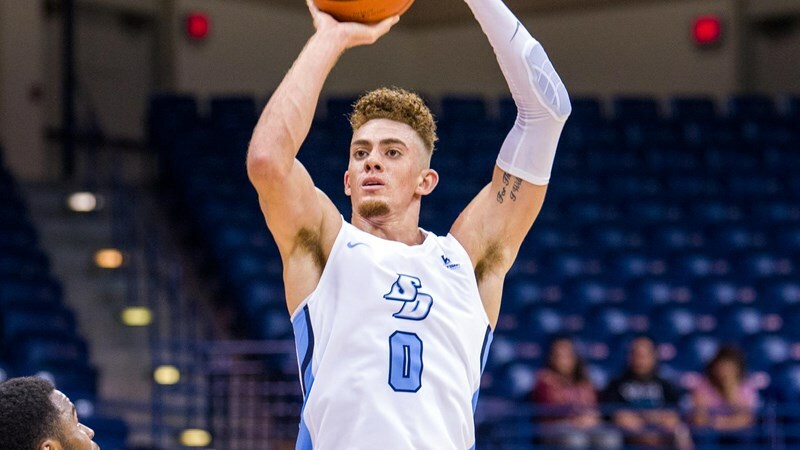 The senior forward scored 27 points, 15 of which came during the last nine minutes, to lead the Toreros to a 70-64 win over the Buffaloes at Jenny Craig Pavilion. USD (4-1) was trailing by eight points with 12 minutes left in the game. Led by Pineiro, the Toreros went on a 17-9 run to tie at the game with a little less than six minutes left. For the next 4:26, USD and Colorado (2-1) traded leads until Pineiro’s go-ahead slam dunk with 1:31 left. From there, the Toreros sealed the victory on an 8-3 run. “It shows our mental toughness, our resolve. We stayed together, we stayed the course. We kept trusting our principles and good things happened,” USD coach Sam Scholl said of the second-half comeback. Olin Carter III contributed 22 points and was 4-of-9 on 3-pointers. Pineiro’s 27 points were just one point shy of his career high. Coming into the game, Colorado was averaging 30 free throws this season. Tuesday, the Buffaloes were held to half that, going nine of 15. USD was 86 percent on free throws and hit 12 of the last 14 attempts in the final 20 minutes. With the win, the Toreros the series with Colorado at 3-3. USD has won the last two. Up next, the Toreros host Jackson State at 7 p.m. Saturday.